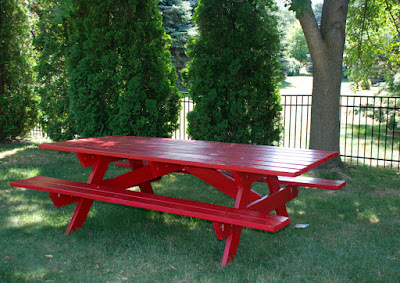 ove my new red picnic table made by Mr. B. It is eight feet long and thirty-six inches wide. We used the free plans from Ana White's site, here, and adjusted them for a bigger size. Now, it just needs a little accessorizing! Perhaps, an outdoor chandelier?? Thank you! It is already groaning...with grandchildren and food! Oh and I forgot to say - you are far too young to be a grandmother!!!!!!! Glenda, we are now BFF's, I am telling you it is the Boots No. 7...LOL! I LOVE it! Mr. B did a fabulous job! A gorgeous picnic table! I love the red color!! I know you will make it a very special spot for the family! Love the red! What shade of red is it?